Just wanted to let you know that after what seems like ages playing with wires and getting things working, it looks like we are about to take to the air for the first time with the Ardupilot and ArduIMU installed and active. 'We' are a team of three from the UK ( Jim, Paul and Iestyn) who have decided to get into UAVs for the engineering challenge. Iestyn and Paul (but not me!) 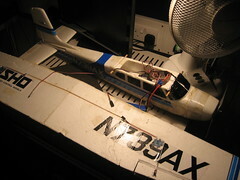 have solid RC plane experience, while I'm bringing the Arduino and software experience. If the weather is in our favour, we hope to fly some time next week. Progress has been tortuously slow, as we are only able to work on this and fly during lunch hours at work! The plan is to fly on manual with all the systems installed and wired up, so that we can make sure we are comfortable with the weight load, power and COG. If we are happy we will flick it over to stabilisation mode and see how the gains look and feel. Before flying we'll do a full test of the systems on the ground, including checking for servo reversing. I don't think there are any questions right now that haven't been answered in the forums or the on-line docs, but I would like to just check a couple of things. We are going to be using a DX6i radio to fly with, but it only has a two position switch (I'm planning on using the 'gear up/down') for the (mode) control line. I don't think this will be a problem will it? (other than only having one AP option to fly with!). When the switch is toggled, which mode will be active? (Stabilisation or Fly-By-Wire? (I've not changed the defaults)). Has anyone got any useful advice for our first flight? Perhaps things they know now which would have been useful back then. What can we expect to see in an airframe running in stabilisation mode that is running with stock settings for the gains, big oscillations? 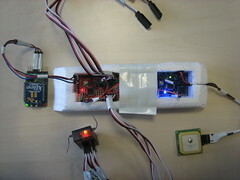 I'm planning on trying to capture telemetry via the laptop through a pair of Xbee's. They are the low power versions so I they will be dropping in and out of range quite often. I haven't got my head around the various Ground Station projects yet, in fact I plan on writing my own (yet another half baked GS). Is there a link to the autopilot telemetry protocol, and perhaps a recommended existing GS project? (I'm sorry, I've not done any research here, I should be able to find these myself). Wish us luck and light winds! What kind of tape are you using on the jumper wires? Is that just silver electrical tape ? No, don't panic! It's white electricians tape, the thin slightly stretchy stuff. All the jump cables are soldered, but I didn't have any single pin housing for them. The tape is there for the insulation, but it's not structural. I will invest in a crime soon, as it takes soooo long to solder all these connectors. My suggestion is to have conservative judgement while it's in the air. If the gains are too high, don't try and see what happens if you flip to AUTO. Don't let the plane stay in the air with bad gains too long. The oscillations can get into a flat spin or stall condition fairly quickly. Doug has a great post about tuning gains. it's really straight forward if you follow his direction. I also find that when I'm dealing with too much new, I forget some basics and I'm more likely to crash. Having a friend there to catch mistakes is invaluable. Thanks Jason, we're not planning on going full auto until we feel comfortable with stabilization. If I understand correctly we can test the gains relatively safely in stabilization mode will still retaining a fair degree of manual control. Is that the best way forward? Yeah, get stabilize going without any wobbles. FBW will test your planes ability to hold a turn. If you go hard right on the stick you should get a nice 45° turn that holds steady in the wind. Ease off the stick to get intermediate angles. My guess is an aileron setup like yours will fly great with the default gains. FBW with manual throttle is excellent for isolating issues, as the throttle gains can be tricky. Hurrah. we've just come back from the flying field. I don't wan't to call it an Epic fail, but we set fire the ESC, which I guess is not a great start! It all started quite well, the initial tests were all good. On the ground, in manual mode we had good control over all the surfaces. We mounted the ardupilot, IMU and GPS just behind the wing. That looked good too. Still on the ground, we put in into stabilisation mode. No servo reversing. GPS locked in, solid blue on both boards. Gains seemed reasonable to the eye, from just rocking the airframe in pitch and roll. We put it back in to manual, disconnected the power, did some more work on the mounting, reconnected the main flight battery and wham! throttle became engaged, Prop spun (probably not full speed) but enough to cause some panic. Fortunately we were aware that this was a possibility, so we had taken precautions. It still nipped at Paul, causing a slight scuffing to the jeans, but it was obvious the ESC had died, smoke poured out of it, followed by that awful smell you get when things have gone really wrong. Power was disconnected quickly, and an assessment of the damage showed that the ESC was the only component to be damaged, so perhaps it was a lucky escape. We've run through several ideas of what could of happened, but the principle candidate right now is we overloaded the ESC's BEC system. The airframe has four servos in place (independent servos for each aileron) and we were powering the GPS, Ardupilot and IMU from it as well. Good job i didn't have the Xbee in place too. The Irony is that we have a standalone switched mode BEC that we were planning on fitting as a safety net, but we ran out of time before having to head out to fly. I think that may have saved us. I don't know how much current this set-up would pull, but the ESC's BEC was rated for 1A, and I'm, surprised we pulled more than that. I'd be interested to hear what the community thinks about this. The Dimension Engineering site suggests that ESC's BEC current supply lowers proportional to the voltage being supplied (3S in our case). So perhaps it's not so unusual to pull more than it can supply. Oh well, another ESC is already in the post. The BEC will be fitted next time and we'll start again.